I had the great pleasure of catching Miss Saigon's Chicago press opening and the special effects lived up to their reputation. 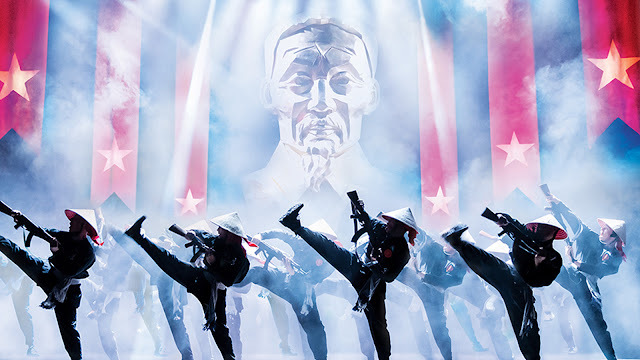 The evacuation of Saigon, featuring a helicopter and gate storming desperation was impressive, and the massive scale dance numbers alone make this a must see. I particularly loved the reunification celebration with a dragon, masked dancers and plentiful acro moves. EMILY BAUTISTA is a delight as Kim, and we were rooting for her till the bitter end. ANTHONY FESTA'S Chris is eye candy with talent, and we're not complaining. RED CONCEPCIÓN is also impressive as greed incarnate, The Engineer, a hustler as amusing as he is despicable. The score is a tear jerker, with beautiful, power numbers, and the story telling is superb in this touring cast's capable hands. It's poignant and eye opening to see the multimedia incorporation of the baby byproducts of the Vietnam war, the rejected and orphaned half American/half Vietnamese children of soldiers. I do like that Miss Saigon doesn't glorify war, and brings up the still timely topics of children in cages, refugees desperate to flee their ravaged homelands, and women as victims of armed conflict. That said, this is likely one of the least feminist musicals I've seen in recent years. Part of me hates to see the same trite tale of a stripper with a heart of gold, women forced to choose between prostitution and starvation, the titillation of exploitation, and war victims as scantily entertainment. Furthermore, men need to stop thinking it's justifiable to threaten a woman's child to bully her into an unwanted relationship, no matter how powerful they are. At least Kim's response to this ploy was cathartic! Still, despite her strength, smarts, and fiercely protective love for her son, she ended up in a horrific position, in forced prostitution in brothels in Bangkok. I found it far fetched and depressing that we're still idealizing the storyline of a woman pining away for 3 years, waiting to be rescued by her baby daddy, a man she fell hopelessly in love with after knowing for literally one night. It also makes me a bit queasy that Kim is seen as a heroine for making the ultimate sacrifice for her son. Desperate single mothers need resources and choices, not more tragic, romantic figures. 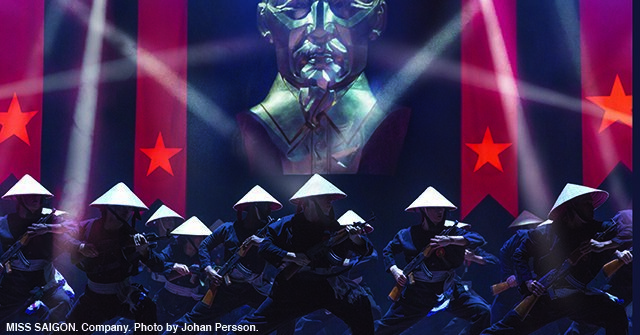 Still, Miss Saigon is a classic, and this production tells the story well. If you're fond of star crossed lovers, wrenching choices, tragic missed connections, and large scale Broadway style spectacle, Miss Saigon is an excellent choice. Cameron Mackintosh’s acclaimed new production of Boublil and Schönberg’s legendary musical MISS SAIGON is now playing a limited engagement at Broadway In Chicago’s Cadillac Palace Theatre (151 W Randolph St) through Saturday, December 8, 2018. Cameron Mackintosh said “It’s hard to believe that it has been over 27 years since MISS SAIGON first opened in North America but, if anything, the tragic love story at the heart of the show has become even more relevant today with innocent people being torn apart by war all over the world. This brilliant new production, directed by Laurence Connor and featuring the original dazzling choreography by Bob Avian, takes a grittier, more realistic approach that magnifies the power and epic sweep of Boublil and Schönberg’s tremendous score. 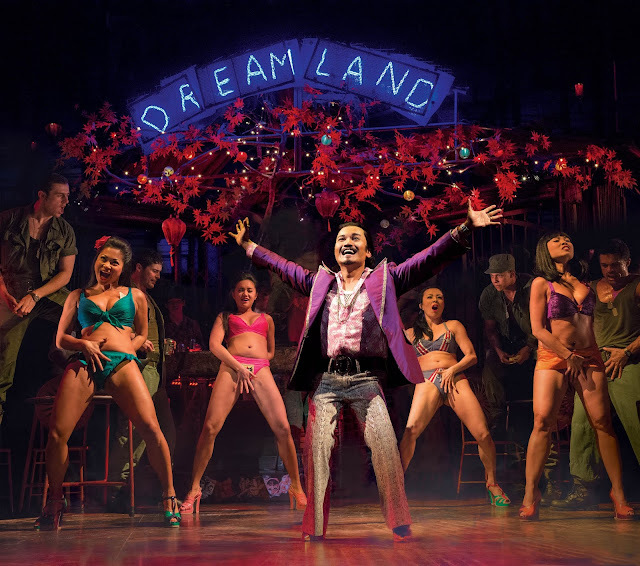 Of all my productions, despite its popularity, MISS SAIGON is the one that the public has had the least chance to see as it requires such a huge international cast of Asian and Western performers and a vast array of visually stunning sets. Now, for the first time in 17 years, as it continues to wow audiences in major cities around the world, theatregoers across America will be able to see one of the most spectacular musicals ever written in all its glory, in a new production that critics in London and on Broadway have embraced. MISS SAIGON has music by Claude-Michel Schönberg with lyrics by Richard Maltby Jr. and Alain Boublil, adapted from original French lyrics by Alain Boublil, with additional lyrics by Michael Mahler. The new production is directed by Laurence Connor with musical staging by Bob Avian and additional choreography by Geoffrey Garratt. Production design is by Totie Driver and Matt Kinley based on an original concept by Adrian Vaux; costume design by Andreane Neofitou; lighting design by Bruno Poet; projections by Luke Halls; sound design by Mick Potter; and orchestrations by William David Brohn. Music supervision is by Stephen Brooker and James Moore, with casting by Merri Sugarman for Tara Rubin Casting. 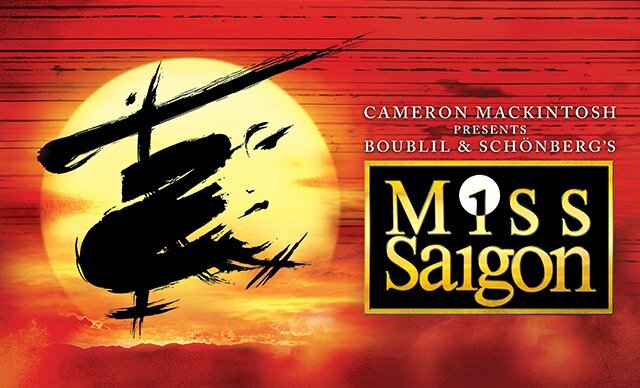 Since its London premiere in 1989, Cameron Mackintosh’s production of Alain Boublil and Claude-Michel Schönberg’s epic musical MISS SAIGON has become one of the most successful musicals in history. The original Broadway production of MISS SAIGON opened on April 11, 1991 with what was the largest advance sale in Broadway history ($37 million). The show went on to play for nearly ten years with 4,111 performances and was seen by more than 5.9 million people. MISS SAIGON has been performed in 32 countries, over 350 cities, in 15 different languages, has won over 70 awards including 2 Olivier Awards, 3 Tony Awards and 4 Drama Desk Awards and been seen by over 36 million people worldwide. Individual tickets are currently on-sale to the public and range in price from $35-$120 with a select number of premium seats available. Tickets are available now for groups of 10 or more by calling Broadway In Chicago Group Sales at (312) 977-1710 or emailing GroupSales@BroadwayInChicago.com. For more information, visit www.BroadwayInChicago.com. J. DAUGHTRY (John). Broadway: The Color Purple, Beautiful. Backup singer: Anthony Brown and Group TherAPy, Patti LaBelle, Donald Lawrence, Bobby Jones Gospel, Kirk Franklin. Tours: Cirque Dreams Holidaze, Motown: The Musical. TV: Boardwalk Empire, Law & Order SVU, Elementary, Orange is the New Black. Universal Studios Japan, Royal Caribbean Cruise Line. Recipient of the Grady- Rayam Prize. His mother is his inspiration and influence, along with pastors and motivational speakers who have seeded his faith and vision. CHRISTINE BUNUAN (Gigi). National tour: The 25th Annual Putnam County Spelling Bee. 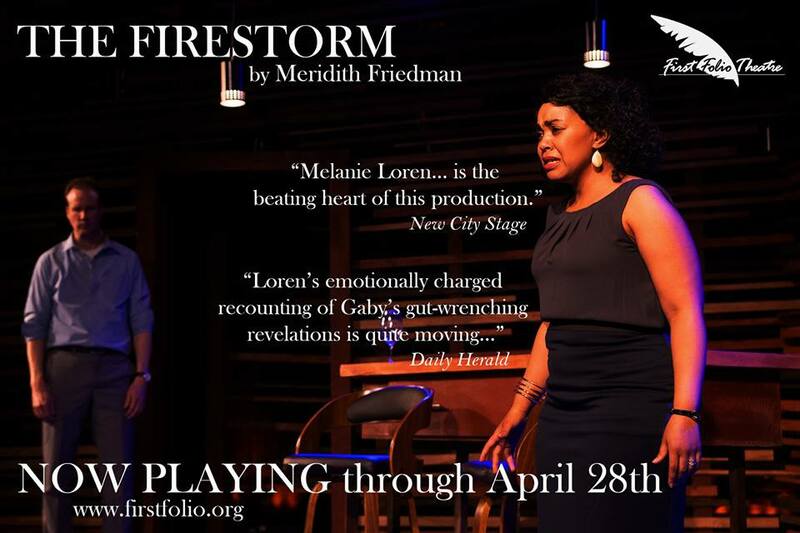 Regional: Writers Theatre, Silk Road Rising, Goodman Theatre, Steppenwolf, Marriott Theatre, TimeLine Theatre, Chicago Children’s Theatre and more. Visit christinebunuan.com for more information. Special thanks to this incredible artistic team, her family and husband, Sean. Dedicated to Mom and Dad. EYMARD CABLING (Ensemble, The Engineer at certain performances, u/s Thuy). 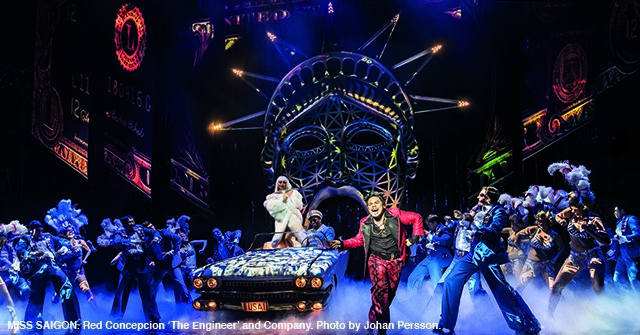 Tours: Miss Saigon in North America and the international tour of The King and I in Asia. Regional: Allegiance (Frankie Suzuki/Mr. Maruyama), The King and I (Lun Tha), Once on This Island (Daniel), Me...Jane at the Kennedy Center and She Loves Me (Arpad) at the Oregon Shakespeare Festival. Carnegie Mellon University B.F.A. My love, Veronica, thank you for being my balance and my light. I love you. ALEXANDER AGUILAR (Ensemble). Broadway: Miss Saigon, Lysistrata Jones. National tour: Memphis. CCM Graduate. Many thanks to this team for giving me this opportunity. BRANDON BLOCK (Swing, Dance Captain) is thrilled to be with Miss Saigon. He has been seen in the pre-Broadway tryout of Roman Holiday (Golden Gate Theatre), in the upcoming feature film Isn’t It Romantic and as Jake in Oklahoma! (Muny, St. Louis). Love to blocNYC, his OUMT family, and his beautiful mother, Maria, and sister, Tiffany. Boomer! RAE LEIGH CASE (Swing) first saw Miss Saigon when she was 8 and has been in love ever since. Credits: Jesus Christ Superstar, A Chorus Line, I’ll Be Home for Christmas, White Christmas, Saturday Night Fever, Curtains, Shrek, Swing, The Color Purple, Spamalot, Mary Poppins, Cats, Peter Pan, Sweet Charity. Love to the best TEAM! TERRY! RYDER KHATIWALA (Tam) is delighted to be making his national tour debut on Miss Saigon. He is in Pre-K, and loved ballet, hip hop, and soccer. You will often find Ryder singing, while cooking dinner for his dinosaurs. MADOKA KOGUCHI (Ensemble) couldn’t be more thrilled to be living in the Dreamland! Credits: Night Beats Revamped, A Chorus Line, Rent, MOTHER-A mother of Kamikaze, Tome Torihama. Recent graduate of AMDA NY. Proud native Tokyoite. Thanks Danny at Hudson Artist Agency! For my incredible husband, mom, brother and family in Japan and the U.S.
GARRICK MACATANGAY (Ensemble). First National Tour: Bombay Dreams. Regional: The King and I (Sacramento Music Circus), Sweet Charity (Center Rep), White Christmas (FCLO), Guys and Dolls (AMTSJ). Thanks to Bloc! Much love to my family and friends with their abundant love and support. Love you Mom, Dad, Glenda, Gio, Maui and Cruz! ADAM ROBERTS (Ensemble, u/s Chris) is elated to be a part of this beautiful show! Broadway: Spider- Man: Turn Off The Dark and Pippin. He has been seen in the national tour of Dirty Dancing, Off- Broadway in Standard Time and as Cornelius in Ozark Actors Theatre’s Hello, Dolly!. He just finished associate directing and choreographing Broadway Backwards. CASEY LEE ROSS (Ensemble, Acrobat). Broadway: Miss Saigon. Theater: Wicked, Chess, Children of Eden (w/ Jon Jon Briones). Film: Step Up, The Other Guys. TV: Lip Sync Battle. Saturday Night Live, The Tonight Show Starring Jimmy Fallon, Flight of the Conchords, America’s Got Talent. Dance double for Josh Groban, Bill Gates, Mark Wahlberg and Brad Pitt. NICHOLAS WALTERS (Ensemble, u/s John) is thrilled to be joining the cast of Miss Saigon. Credits: Lusty Lil’s Wild West Revue (Cedar Point Live Entertainment), Hair (Three Rivers Music Theatre). Proud graduate of Ball State University’s BFA Musical Theatre program. Much love to my wonderful friends and family. MICHAEL WORDLY (Ensemble, u/s John). Off-Broadway: Spamilton. Tours: The Color Purple (First Revival National Tour), The Little Mermaid (u/s Sebastian, 5th Avenue Theatre). Regional: Memphis (Gator), Smokey Joe’s Cafe (Adrian) and Hairspray (Seaweed). Giving honor and thanks to God for all His blessings! Many thanks to my family, Gregg Baker Management and Tara Rubin Casting. WakandaForever. ANNA-LEE WRIGHT (Ensemble, Assistant Dance Captain). Broadway: Miss Saigon. Tours/International: Miss Saigon (u/s Gigi), The Venetian, Macau (opera singer). TV/Film: MTV’s Ladylike (series regular), Love is a Broadway Hit (Bridgette Wu). Love to Eddie at Take3, TR Casting, T and the entire creative team. ALAIN BOUBLIL (Book & Lyrics). Librettist/original lyricist of the musicals La Révolution Française, Les Misérables, Miss Saigon, Martin Guerre and The Pirate Queen with Claude-Michel Schönberg, and Marguerite with Michel Legrand. Co-wrote the screenplay and co-produced the movie soundtrack of Golden Globe–winning Les Misérables (Academy Award nomination, Best Song). Author: plays The Diary of Adam and Eve and Manhattan Parisienne, prize-winning novel Les Dessous de Soi. Awards: two Tony, Grammy and Victoires de la Musique awards; Molière, Evening Standard and Olivier awards; special Grammy honor; honoree of NY Pops at Carnegie Hall (2016). Producer: Boublil/Schönberg Do You Hear the People Sing worldwide symphonic concerts. Member, Board of Directors, NY Pops. CLAUDE-MICHEL SCHÖNBERG (Concept, Book & Music). Co-book writer and composer of La Révolution Française, Les Misérables, Miss Saigon, Martin Guerre and The Pirate Queen. Co-wrote Marguerite in collaboration with Alain Boublil, Michel Legrand, Herbert Kretzmer. Supervised overseas productions and co-produced international cast albums of his shows. Composed the ballet scores for Wuthering Heights and Cleopatra for Northern Ballet. Co-wrote the screenplay and reconceived the music for the Les Misérables musical movie. Golden Globe and several times Tony and Grammy winner, Oscar nominee, 2016 honoree of the New York Pops at Carnegie Hall with Alain Boublil. Appointed visiting Professor of Contemporary Theatre at St. Catherine’s College, Oxford University. CAMERON MACKINTOSH (Producer). For over 50 years, Cameron has been producing more musicals than anyone else in history, including the three longest-running musicals of all time: Les Misérables, The Phantom of the Opera and Cats. His co-production with Disney of Mary Poppins continues to sprinkle its magic worldwide. He, with Working Title, enjoyed huge success with the film of Les Misérables. He owns eight London theatres, including the Victoria Palace, which after a major rebuild and refurbishment, has re-opened with the award-winning musical Hamilton, co-produced with Jeffrey Seller. This year, Cameron will have 22 productions running around the world, including 5 in London’s West End. His new productions of Les Misérables, The Phantom of the Opera and Miss Saigon are currently touring North America to great acclaim. Cats will also launch a U.S. tour in early 2019. Cameron was knighted in 1996 and is the first British producer to be elected to the Theater Hall of Fame; and the recipient of the 2017 Stephen Sondheim Award. RICHARD MALTBY, JR. (Lyrics). Broadway: conceived and directed two Tony Award Best Musicals: Ain’t Misbehavin’ (1978, also Best Director); Fosse (1999). Ring of Fire (2006). With composer David Shire: director/lyricist: Baby (1983); lyricist: Big (1996). Co-lyricist: Miss Saigon (1989); The Pirate Queen (2007). Director/co-lyricist: Song & Dance (1986). Director: The Story of My Life (2009). Off- Broadway: director/lyricist: Starting Here, Starting Now (1977); Closer Than Ever (1989). Director: Just Jim Dale, Roundabout (2014), London (2015). Regional: lyricist: Take Flight, Chocolate Factory (2010), McCarter (2012); book/lyrics, Waterfall, Pasadena, Seattle (2015). Film: screenplay, Miss Potter. Contributes cryptic crossword puzzles to Harper’s. Son of well-known orchestra leader. Children: Nicholas, David, Jordan, Emily, Charlotte. WILLIAM DAVID BROHN, 1933–2017 (Orchestrations). For Cameron Mackintosh: Miss Saigon; Mary Poppins; Oliver! ; Barnum; Half a Sixpence; Betty Blue Eyes; My Fair Lady; Carousel; Hey, Mr. Producer! ; Witches of Eastwick and Oklahoma. Further commissions included: Wicked, South Pacific, Crazy for You, Porgy and Bess, The Secret Garden and Show Boat. Bill Brohn was a respected collaborator for many productions and celebrated a thirty-year history alongside Cameron Mackintosh and his creative teams. LAURENCE CONNOR (Director). Theatre: School of Rock (Broadway, West End, U.S. tour), Les Misérables (Broadway, West End, worldwide, U.S. tour), Miss Saigon (West End, U.S and U.K. tours, worldwide), Jesus Christ Superstar (U.K. arena tour, Australia), the entirely new stage production of The Phantom of the Opera (U.S., U.K. tours), Oliver! (U.K. tour). Concerts: The Phantom of the Opera 25th anniversary (Royal Albert Hall, worldwide cinema streaming, DVD), Les Misérables 25th anniversary (O2 Arena, worldwide cinema streaming, DVD), Miss Saigon 25th anniversary (cinema release, DVD). Awards: Miss Saigon West End (Best Direction – WhatsOnStage, Broadway World awards), Miss Saigon Australia (Best Director of a Musical – Green Room Awards), Les Misérables Korea (Best Director of a Musical). BOB AVIAN (Musical Staging) began his career as a dancer in more than a dozen Broadway shows including West Side Story and Funny Girl. He then became an integral part of every Michael Bennett production for the next 20 years, working as associate choreographer and/or assistant director on Company, Follies, Twigs, Seesaw and God’s Favorite; co-choreographer of A Chorus Line (Tony Award); co-choreographer/co-producer of Ballroom (Tony Award); and producer of Dreamgirls. London: Follies, Miss Saigon and Sunset Boulevard (both also Broadway), Martin Guerre (Olivier Award), The Witches of Eastwick. Additional Broadway: Putting It Together, A Chorus Line (director, revival, also at London’s Palladium). GEOFFREY GARRATT (Additional Choreography). Musical staging: Les Misérables (Broadway). Assoc./Additional Choreography: Broadway: Mary Poppins. West End: Miss Saigon; Mary Poppins; The Witches of Eastwick; Betty Blue Eyes; Oliver! ; Hey, Mr. Producer! ; South Pacific. Dance Captain: Martin Guerre, Cats. U.K. tours/international: Les Misérables, Mary Poppins, The Witches of Eastwick, Oliver!, Miss Saigon. Choreography: Jack and the Beanstalk, Blues in the Night, Fascinating Aïda, A Doll’s House, Little Shop. TOTIE DRIVER (Set Design) has 25 years’ experience working on the stage designs for the National Theatre, Royal Shakespeare Company, Donmar Warehouse, Theatre de Complicite, Glynedebourne and London’s West End. She is a visiting lecturer on Stage Design at Nottingham Trent University. For Cameron Mackintosh: stage designer for Oliver! U.K. tour, Ghent and Antwerp; Miss Saigon U.K. tour 2002 and subsequently Korea, Australia, Japan, Brazil and Utrecht. For the 2014 return to the West End, she collaborated with Matt Kinley, winning 2015 WhatsOnStage Best Set Design. MATT KINLEY (Set Design) graduated from the Motley course in 1994 and spent the next decade working in The National Theatre and West End. As part of a long working partnership with Cameron Mackintosh, he has adapted and designed productions of My Fair Lady, Mary Poppins, Phantom and Les Misérables all over the world amongst the design of numerous other international shows. 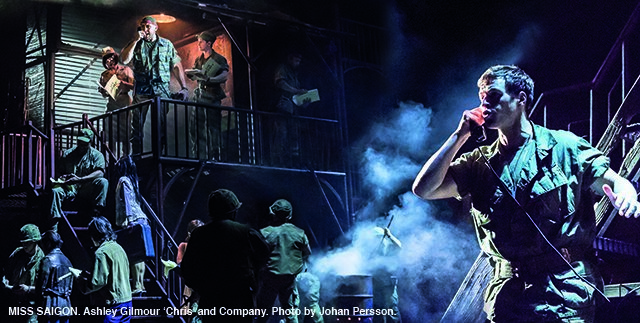 In 2013, Matt worked alongside Totie Driver to redevelop Miss Saigon ahead of its London revival. They have continued their relationship to bring you this new version. ADRIAN VAUX, 1936–2012 (Design Concept), studied design at the Slade School. London: house designer at Mermaid Theatre (1964–1970), Leicester Phoenix/Haymarket (1971–1980), Old Vic (1980– 1982); West End credits including My Fair Lady, Cause Célèbre, Tomfoolery. He began working in Israel in 1968, amassing extensive credits including the original production of Ghetto. 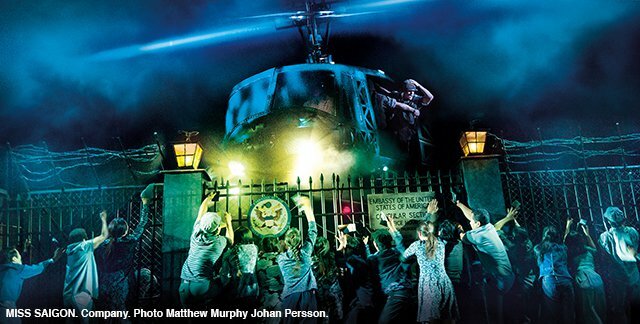 Recent work: international tours of Miss Saigon and Oliver! ; August: Osage County for Habimah in Israel. ANDREANE NEOFITOU (Costume Design). Theatre includes Les Misérables (Tony nomination) and Miss Saigon (worldwide); Once in a Lifetime, Nicholas Nickleby, Hedda Gabler, The Merchant of Venice, Fair Maid of the West, The Changeling (all Royal Shakespeare Company); Peter Pan (National Theatre); Grease (West End); Miss Julie (Athens); Carmen (Royal Albert Hall); Timon of Athens with David Suchet (Old Vic); Martin Guerre (Guthrie); Nabucco (The Met); Jane Eyre (Broadway, Outer Critics Circle nomination). Film includes Rosencrantz and Guildenstern Are Dead, directed by Tom Stoppard. BRUNO POET (Lighting Design) works extensively across theatre, opera, dance, music and live events. He won the Olivier Award for his lighting on Danny Boyle’s Frankenstein at the National Theatre and a Knight of Illumination Award for his lighting on Sigur Ros’ 2012–2013 world tour. He subsequently designed the lighting for their current 2016–2017 world tour. His international work includes productions for the National, RSC, Royal Opera House, Los Angeles Opera, Chicago Lyric Opera, Bregenz Festival, English National Opera, Royal Danish Opera, The Royal Ballet and in the West End. LUKE HALLS (Projections) is a video designer for theatre, opera, dance and music. He has received a Knight of Illumination Award for Don Giovanni at the Royal Opera House and a BAFTA for his work on ITV’s The Cube. Luke has designed internationally for music artists including, most recently, Beyoncé (Formation world tour), Adele (2016 world tour) and U2 (2015 world tour). His theatre work includes Half a Sixpence (West End), Man and Superman (National Theatre) and Hamlet (Barbican) starring Benedict Cumberbatch. MICK POTTER (Sound Designer) has designed the sound for over 100 musicals worldwide including Broadway and West End productions of School of Rock (Drama Desk Award nominee), Les Misérables (Tony Award nominee, Helpmann Award), The Phantom of the Opera (Parneli Award), Miss Saigon, Evita, The Woman in White (Olivier Award), Bombay Dreams, Saturday Night Fever, Sunset Boulevard, From Here to Eternity, Betty Blue Eyes, The Wizard of Oz, Love Never Dies (Green Room Award), Sister Act, Joseph..., Zorro, The Sound of Music, Half a Sixpence and Cats. STEPHEN BROOKER (Musical Supervisor). Conductor/Musical Director: Les Misérables film. Supervisor: Les Misérables (NY, London, Tokyo), Half a Sixpence, Barnum, Oliver!, Mary Poppins, Miss Saigon, Cats, My Fair Lady, The Secret Garden, South Pacific, Chess, The Woman in White, Saturday Night Fever, The Phantom of the Opera. Conductor: symphonies and choirs worldwide including Royal Choral Society for Her Majesty Queen Elizabeth. Composer: Walt Disney, Coca-Cola, Ford Motors, BMW Motor, Jaguar Cars. Produced recordings of Les Misérables, Oliver!, Mary Poppins, South Pacific. Conducted the 85th Academy Awards. JAMES MOORE (U.S. Musical Supervisor). Broadway: On the Town, Gigi, Follies, South Pacific, Ragtime, Steel Pier, Company. National tours: The Producers; Kiss Me, Kate; Crazy for You; And the World Goes ‘Round—The Songs of Kander and Ebb. Regional: Signature Theatre, Ford’s Theatre, Paper Mill, The Muny. Symphonic: National Symphony Orchestra, Orchestra of St. Luke’s, The Kennedy Center Opera House Orchestra, The Santa Barbara Symphony. Recordings: On the Town, Follies. Education: Master and Bachelor of Music degrees from the Indiana University Jacobs School of Music. Evita, A Little Night Music, Finian’s Rainbow, Good Vibrations (Associate Director); Mary Stuart, Rock’n’Roll, Frost/Nixon (Assistant Director); The Coast of Utopia (Assistant to the Director). National Tours: Miss Saigon, The Phantom of the Opera (Executive Producer and Associate Director); Billy Elliot (Resident Director). Seth directed the national tours of Frost/Nixon and Evita (2012 revival). Seth serves as Executive Producer for Cameron Mackintosh Inc. in NY. Graduate of Vassar College. JESSE ROBB (Associate Choreographer). Broadway: 2017 Revival of Miss Saigon (Associate Choreographer) and The Cher Show (Associate Choreographer). Toronto: We Will Rock You (Resident Choreographer), Dirty Dancing (Resident Choreographer), The Lord of The Rings (Dance Captain). Vegas: Cirque Du Soleil’s Zumanity (Dance Captain). Jesse recently choreographed Elizabeth Cree for Opera Philadelphia and Ragtime at the Ogunquit Playhouse. He has served as associate director/choreographer at 5th Avenue Theatre, Goodspeed Musicals, and Berkshire Theatre Group, among others. WILL CURRY (Music Director/Conductor). Broadway: My Fair Lady (LCT), Miss Saigon, Fiddler on the Roof, Les Misérables. National Tours: Les Misérables. Cast Albums: My Fair Lady, Fiddler on the Roof, John & Jen. Education: Northwestern University Bienen School of Music. For my family and Sebastian. @wjcurry. JACK STEPHENS (Company Manager) has hit the road with many great touring productions, including The Magic of David Copperfield, Blue Man Group (North America and Latin America), Into the Woods, Disney’s Beauty and the Beast, A Chorus Line (North America and Tokyo), Finding Neverland, Shrek The Musical (Asia) and Rent, among others. He resides in Denver and Las Vegas. JUSTIN T. SCHOLL (Associate Company Manager) is proud to be joining the Saigon family. Broadway: Lady Day at Emerson’s Bar & Grill (Assistant to CM). Tours: Gentleman’s Guide, R&H’s Cinderella, Shrek The Musical (International), Beauty and the Beast (International), Elf, Flashdance, and Broadway Rox. Thanks for everything Mom, Dad, Sydney, my Human and Cookie. JOVON E. SHUCK (Production Stage Manager). A proud member of AEA and graduate of Michigan State University, Jovon’s credits include the national tours of: Waitress, Hedwig and the Angry Inch, The Phantom of the Opera, The Lion King and Monty Python’s Spamalot. Much love to Sheila Marie, always. MICHELLE DUNN (Stage Manager). Broadway: The Lion King, Jumpers, Bridge and Tunnel, Dance of the Vampires. National Tours: The Phantom of the Opera, The Lion King, Dreamgirls, Hairspray. Other credits include: Houston Ballet and Disney Cruise Line. Love and thanks to my family for your never-ending support. For Dad. STEPHANIE HALBEDEL (Assistant Stage Manager). 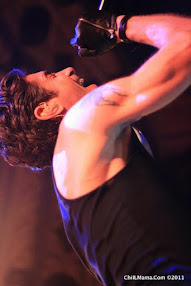 Credits include the most recent national tours of Les Misérables, The Phantom of the Opera, Dirty Dancing and Blue Man Group, as well as shows throughout the Northeast and New York. All love and thanks to my dear family. RACHAEL WILKIN (Assistant Stage Manager). 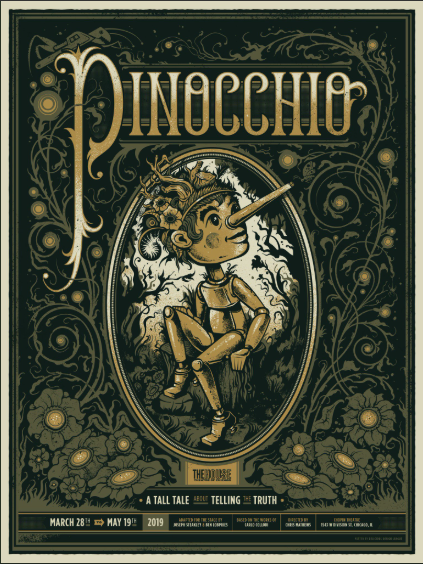 National Tours: Waitress, Fiasco Theater’s Into the Woods, Pippin. Regional: Edinburgh and NY Fringe Festival, RWCMD. Scenic fabrication/painting: The Humans (Broadway). NICHOLAS ALLOTT (Executive Producer) joined Cameron Mackintosh in 1981 as Executive Producer for Cats and subsequently Les Misérables, Miss Saigon, The Phantom of the Opera, Oliver! and Mary Poppins, amongst others. Executive Producer of the feature film of Les Misérables. Since 2000, Managing Director of Cameron Mackintosh Ltd. Chairman of Soho Theatre, Trustee of the Roundhouse, Patron of Shakespeare Schools Festival and U.K. Business Ambassador for the Prime Minister’s Office. Awarded an OBE for services to theatre and charity by the Queen in 2014. SETH WENIG (Executive Producer) has been with NETworks since its inception in 1995. He spearheaded the international tours of Fosse starring Ben Vereen and Ruthie Henshall. Seth has produced the Lincoln Center Theater production of Rodgers & Hammerstein’s South Pacific and the National Theatre production of War Horse. Together with Cameron Mackintosh, Seth served as Executive Producer for both the U.S. and U.K. tours of the National Theatre’s My Fair Lady, the 25th Anniversary U.S. Tour of Les Misérables, the new The Phantom of the Opera tour, Miss Saigon and A Bronx Tale. He is most proud of his greatest productions – Marlo and Camden. NETWORKS PRESENTATIONS (Producer), from its inception over 20 years ago, has been an industry leading producer and manager of touring musical theatre productions and remains committed to delivering quality entertainment to audiences worldwide. Having toured over 70 productions internationally, NETworks’ current and upcoming touring productions include Cameron Mackintosh’s The Phantom of the Opera, Les Misérables, Elf the Musical, Finding Neverland, The Sound of Music, Rodgers & Hammerstein’s The King and I, The Band’s Visit, A Bronx Tale, Falsettos, Fiddler on the Roof and Cameron Mackintosh’s Miss Saigon.